Bipasha Basu* is known for her strong personality, but is she a diva? Strength of personality is a composite of different personality traits, and at times not everything about a strong person is considered pleasant. Let us see what Bipasha's hands tell us when we delve a little deep. does have softening and balancing signs in the shape of her conic fingers and flexible hand and fingers. These signs indicate a certain impressionability and idealism. However, she has to be careful of a certain doggedness of will which when combined with a strong Upper Mars can make her difficult to convince and unreasonable at times. She is known for her short temper, but her hand does not show a particularly short temper! If she appears fierce it is for other reasons. Bipasha has a square palm, longish fingers, and a separation of the head and life lines. Her fingers are tapering, almost conic, her head and heart lines are balanced, and the headline starts from the Jupiter mount. She has long, slim first and slightly thick and long third phalanges, but average or short second phalanges to her fingers. Check out her hand photo here and here. Clearly, she is an immensely independent person, bold and impulsive. At times her independent nature when combined with her impressionability can draw her into taking decisions she could later regret because she may not follow advice. In addition, she is rather dominating, although she is not manipulating or controlling. She is more obviously bossy, and likes to have her own way. Most of the time, however, the qualities of common sense and thoughtfulness which she has in plenty help her manage her weaknesses. She has a fairly stable headline, developed knots, and longish fingers. As a person, she can be too serious at times, even melancholy and certainly moody. The sensual and physical side of her is strong. She is the type who will be in tune with her own body. She had the potential in her to become a successful sportswoman. Her Headline tells us of an extraordinary ambition to be successful, an ambition she’s nurtured from a very young age. She is capable yes, although acting talent per se is not evident in her hand in any great amount. However, with her ambitious nature and strong desire to improve and learn, she was always likely to evolve into someone talented in whichever field she chose. If one examines her fingers, tips and phalanges, particularly that of Apollo, one can see in her a love for form, colour and beauty, and this helps her greatly in her work. She has an instinctive and intuitive approach which works. She can go with the flow and achieve good results. Her hand may not show a developed business sense, what it does show is practicality and shrewdness sufficient for her to be able to put to use her abilities in an effective way. She is likely to be particular about small things. If one combines this trait with her domineering nature it can make her difficult to please. She is likely to have struggled to communicate effectively in her life, although as she grows older, she will develop in this area. If one has to conclude, one can say that Bips’ hand shows her to be an ambitious and determined person and also strongheaded at times. It also shows her to be impressionable and idealistic. She is very capable, and will keep re-inventing herself as she grows older. Her hands do not show her to be a diva, she is too sensible for that. Her head is firmly on her shoulders. However, it is likely that she is a much misunderstood person, due to her difficulty in communicating her deepest feelings. *Bipasha Basu is an Indian actor. Or check out some more Bollywood stars like Hrithik Roshan, Aamir Khan or The magic behind Rajesh Khanna's super stardom have also had their hands read on this website. Or the hand readings of all other Bollywood (Indian) actors on this blog, and also actors from Hollywood. i wonder if being strongheaded is a good trait in a woman.Abraham parted ways with her for her strong individuality(not brashness as you point out).john could have been the more compromising person and a possible scapegoat had their courtship culminated into marriage? what does his hand tell? also,who is better at handing matters of the heart? What is this diva? I also wonder if its possible to dominate without being manipulating / controlling... But overall, her hand tells that she is a balanced personality or about to become one. Good for her. Anonymous, I do not think that the quality of strong headedness should have a connection to gender because finally it depends on two human beings and how they fit. Also, no human being is perfect and the other person may have a deeper flaw in the personality. I have not seen John's hand but one can perhaps assume that he was the more compromising of the two. As they were living together I think that he must already have known her for who she was and he was fine with it wasn't he. I do not see a logical reason for a man to change his mind after almost a decade! As I mentioned, there are far worse flaws in human beings than just being dominating. Also I did not say that Bipasha is not brash. She is to some extent from what I can see from her hand, although I may not have used that word. Diva is a word used in a negative sense when some celeb is considered spoilt and demanding. And yes it is possible to be dominating and not controlling although these traits are often found in one person. Dominating people are often controlling and manipulative but manipulative people are not usually dominating. Manipulative people are generally wary of direct confrontation and prefer to get things done is an indirect way. Often the people who are being manipulated may not even realise that they are being manipulated depending on how clever they are. There is an element of deceit involved here. There are some people who are just overtly dominating and bossy but they may be quite straightforward actually. Bipasha is one of those. She is not afraid of confrontation. Often the way we are brought up affects these qualities. I have seen that children brought up in very strict or intimidating environments become manipulative as adults because they know that confrontation does not work. If not a sportswoman, she has certainly gained one of the most athletic bodies. This post was a rather surprising. For some reason, I didn't think of Bipasha Basu as ambitious. Of course, one cannot really say much of celebrities coz their lives are so so different from what it seems to be. It was, nevertheless, a very very interesting read. May I request you Nita, to do an analysis of Sushmita Sen? If one is to call someone a Diva (and I don't mean it in a negative sense), it would have to be her. Her confidence, her relationships with people, her grace just make her so magnetic. It would be awesome to get a glimpse of who she really is. I think it will take a very confident man to live with someone like her. I think it is shameful that John left her after being with her in her best years. TN, I know what you mean. I hope she finds someone better. ..nice reading per say..but i was hoping u could read someone with much more diverse or influential effect on cinema..sure good for her if she is ambitious and all but ..cmon now there are much more talented personalities than her...that we would be curios about,why not read robin wiliams,stanley kubrick(great director)...mam i expect i don't disrespect u by making this point. Yeah sure, there are a lot more talented personalities than her. But I read all famous people's hands, whether they are talented or not. It depends a lot on whether sufficiently clear photos of their hands are available. I am not sure whether hand photos of say stanley kubrik are available. If they are I will certainly read this hands! I make a note of all requests and keep checking for their hand photos. It is fun to read your analysis and think about the characters I have seen these actors play. Any chance you could find enough high quality photos to read Rehka's hands? Thanks Sinthea. And Rekha is a fascinating woman, isn't she. She goes on my list. Lets see, it seems unlikely to get her photos as she is a private person but I keep collecting hands and store them in a file on my pc. At times some news item suddenly brings these celebs into the limelight and by chance one could get a decent hand photo sometime in the future. pl try give complte palm prints with all lines & explanation for what they are they? it is all character reading & nothing there which is called future reading. which mount or lines or anyother? cannot we publish palm prints of all famous people,specific peoples with all details? shriram, I think you posted your comment on the wrong post. Anonymous, first of all I do not have the complete palm prints. And if by chance I find a photo on the net with the palm lines I cannot publish it here due to copyright reasons. The photo I have published is allowed to be published by the site from where I took it from. Secondly, the future cannot be told in by hand-reading. 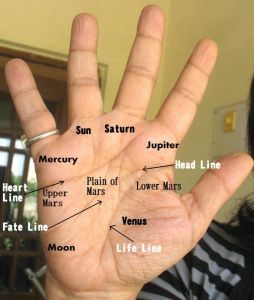 If anyone says the hand tells of a specific future, he/she is a fraud. However, some future trends can be seen, very broad trends, and these too are liable to change. There is no fixed future as can be seen from the hand. Thirdly, I do not provide detailed explanations here as this blog is not meant for that. I am writing a book in which the details will be given. I do not have any intention of doing it here on this blog as a lot of the reading is from my own personal research over the past 30 years. This blog is for those interested in the personalities of celebs, and that is what I provide, some glimpses into their personalities. This is not a teaching blog. Nita-ji, thanks for the lovely posts. I have (somewhat) become addicted to your blog. Will you consider some business men like Ambani brothers? will take you to other posts on business people from around the world.